Legendary actress, teacher, and author Uta Thyra Hagen was born on June 12, 1919 in Göttingen, Germany to an artistic family. Her mother was a Danish opera singer and teacher, and her father started the Handel Opera Festival in Göttingen. Six years after Hagen’s birth, the family emigrated to the United States, moving to Madison, Wisconsin. It was here, in the Midwest, where Hagen was raised until the age of sixteen. In 1937, Hagen achieved her first professional role as Ophelia in Le Gallienne’s production of HAMLET at the Cape Playhouse in Dennis, Massachusetts. The following year, Hagen went on to play the leading role of Nina in her first Broadway production of Anton Chekhov’s THE SEAGULL. Hagen was just 18 at the time. In the longest-running Shakespearean production ever in the history of Broadway, Hagen played Desdemona, opposite Paul Robeson as Othello and her then-husband Jose Ferrer as Iago (1943-44). She took the Broadway stage again in the replacement role of Blanche DuBois in A STREETCAR NAMED DESIRE, and later for the national tour, which closed in 1949. It was in the 1947 Broadway production of THE WHOLE WORLD OVER, directed by Harold Clurman, where Hagen met her co-star and future husband, Herbert Berghof. That fall, she would join the faculty at Herbert Berghof Studio (HB Studio) where she taught tirelessly until the end of her life. Hagen originated the role of Georgie Elgin in Clifford Odets’ THE COUNTRY GIRL, winning her first Tony Award in 1951. Hagen also played George Bernard Shaw’s SAINT JOAN on Broadway that same year. She married Herbert Berghof in 1957 and played opposite him in the New York City Center production of TOVARICH. Through the 50s and 60s, they toured together in THE LADY’S NOT FOR BURNING, THE AFFAIRS OF ANATOL, and CYPRIENNE (DIVORÇONS) by Sardou. She was famous for originating the role of Martha in the 1962 Broadway premiere of WHO’S AFRAID OF VIRGINIA WOOLF?, in which she earned her second Tony Award and won the London Critics Award for her role in the English production. Throughout her career, Hagen made several television appearances, including PLAYHOUSE 90, KRAFT THEATRE PLAY OF THE WEEK, CBS specials, guest appearances on THE LONG HOT SUMMER, LOU GRANT, THE TWILIGHT ZONE, and THE HOME on PBS’s AMERICAN PLAYHOUSE. She received Daytime Emmy Award nominations for her television appearances in ONE LIFE TO LIVE (1986) and ABC AFTERSCHOOL SPECIALS – SEASONAL DIFFERENCES (1987). Hagen also appeared in the films REVERSAL OF FORTUNE (1990) and THE BOYS FROM BRAZIL (1978), for which she was nominated for an Academy Award for Best Supporting Actress. Hagen was one of the most renowned and respected acting teachers of the 20th century. She was highly sought-after and influential among those she trained at HB Studio, and quickly adopted the role of master teacher and studio co-lead, beside her partner in love and work, Herbert Berghof. During her time at the acting studio, she authored best-selling acting texts, the seminal RESPECT FOR ACTING and the definitive A CHALLENGE FOR THE ACTOR. Both texts still enjoy worldwide distribution among university students studying drama. Her most substantial contributions to theatre pedagogy were a series of “object exercises” that remain prominent training for acting professionals. In 2001, the documentary UTA HAGEN’S ACTING CLASS features Hagen in a series of master classes on her exercises. After the death of her husband in 1990, Hagen concentrated on reorganizing HB Studio and The HB Playwrights Foundation, and continued to appear in many of the Foundation’s productions. She played the title role in Nicholas Wright’s MRS. KLEIN, a production that won great critical acclaim during its 1996-1997 run and later toured with major appearances. For her work in MRS. KLEIN, Hagen won the Obie Award. During 1981-1983, Hagen was inducted into The Theater Hall of Fame and the Wisconsin Theater Hall of Fame. She received honorary doctorates from Smith College, DePaul University, and Wooster College. In July 1986, Hagen was awarded the Mayor’s Liberty Medal along with The John Houseman Award and The Campostella Award for distinguished service in 1987. Among Hagen’s numerous awards was her third Tony Award for Lifetime Achievement in 1999. In March 2003, Hagen was awarded the National Medal of Honor for the Arts. She was honored, along with the other recipients, in a gala ceremony at the White House. 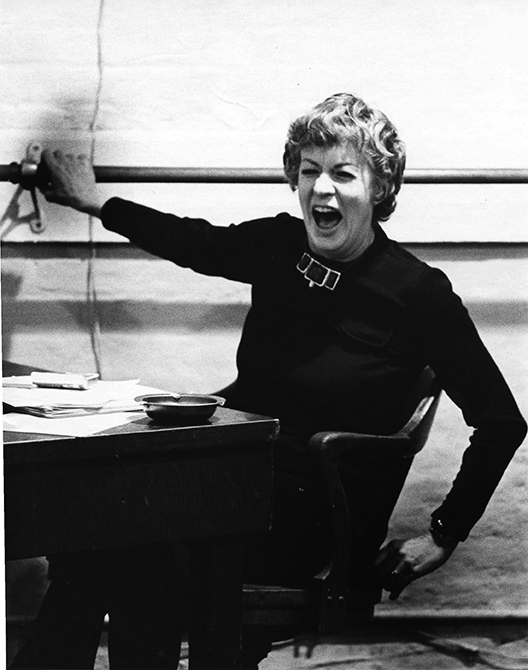 Uta Hagen left a remarkable and lasting legacy on the field of theatre and the dramatic arts when she passed on January 14, 2004. She is survived by her daughter, Leticia Ferrer, who continues work at her mother’s theatrical home, HB Studio, and granddaughter Teresa Teuscher and great-granddaughter Thyra Bielfeldt. ...an affordable acting studio in the community to be taught by working professionals.